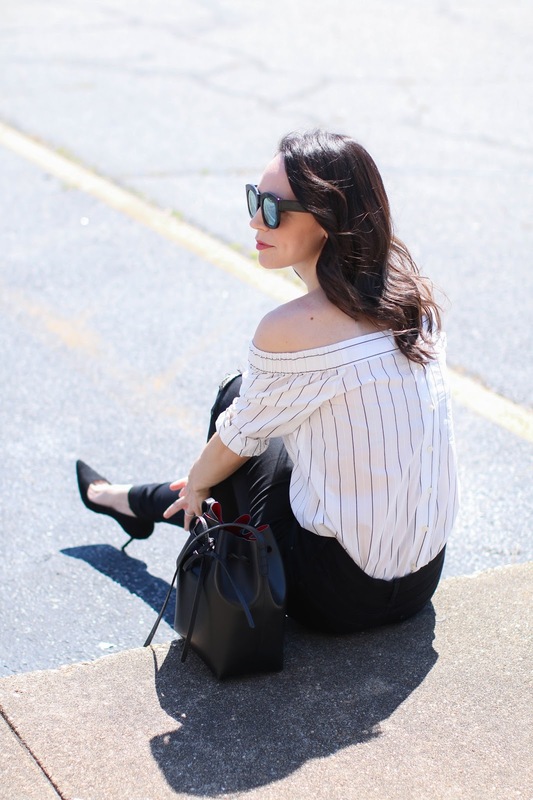 I'm a huge fan of button down shirts (this is my favorite brand), so I was instantly drawn to this somewhat deconstructed off the shoulder button down. The thin stripes make it a bit edgier so I felt it would look better paired with skinny distressed jeans rather than a skirt or shorts. Most off the shoulder tops I have come across this summer are quite feminine looking, but I enjoy switching things up a bit with something like this. These Topshop jeans are still one of my favorite ones to wear because they feel more like a brushed cotton/jegging than actual denim. Most Topshop jeans come in various inseam lengths making it easy to find one for those of us not blessed with mile long legs. The Nordstrom Anniversary sale is still going on and I have to really hold myself back from buying anything else - but I did end up picking up this amazing moto jacket after my initial haul because it was less than $65 (if you are interested in it, keep checking back because people usually return sizes and they become available again)! The only other item I am contemplating is these booties which seem like a perfect fall staple. I probably will decide to skip them because I would like to save up for a fall bag (deciding between this one and this one). Any additional Nordstrom Annniversary items still haunting you that you didn't pick up? LOL Leave me a comment below!